Use this meat to make quick stews or sandwich filling - or shred and add to barbecue sauce for unusual sloppy joes. *Optional - if you do not have a smoker, but still want your meat to have a smoked flavor, add liquid smoke to taste. A suggested place to start is 1 tablespoon. Place meat in a single layer in large, glass baking dish. In food processor or blender, combine all marinade ingredients; process until smooth. Pour half the marinade over meat. Turn meat over and cover with remaining marinade. Place plastic wrap directly on surface of meat. Refrigerate at least 3 hours. Note: If you do not have a smoker or prefer meat to be unsmoked, skip the smoking procedure and proceed to the canning procedure. Prepare hot smoker and soak your favorite wood chips. Hickory, mesquite, cherry, alder, apple or maple are typically used. Fill water pan of smoker about 2/3 full with water. Drain meat, reserving marinade. Place meat on top and bottom racks of hot smoker. Top meat with thinly-sliced onion, if desired. Smoke meat until meat is medium doneness, usually 2 to 3 hours, basting meat once with marinade and reversing position of the racks. Remove meat from smoker; cool slightly. In medium saucepan, combine all canning broth ingredients. Heat to boiling. Remove from heat; set aside. Cut meat into 1 to 1-1/2-inch chunks. 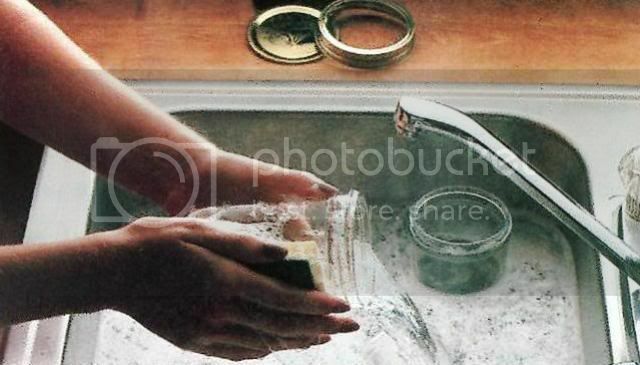 Wash pint jars, bands and lids in hot, soapy water. Rinse well. Place jars and bands in sink filled with hot, clear water. Place lids in saucepan. Cover with hot water. Heat to barely simmering over low heat. If you skipped the smoking procedure, cut marinated meat into 1 to 1-1/2-inch chunks and cook to rare; pack while still hot. 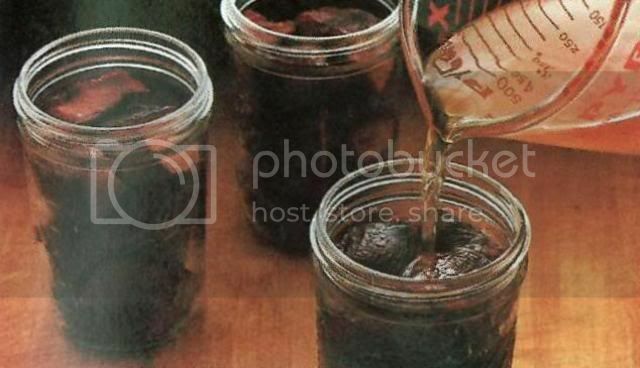 Smoked chunks can be packed warm into jars. Whether smoked or unsmoked, leave a one-inch space at top. Add boiling broth, leaving 1-inch space at top. Wipe rims with clean cloth. 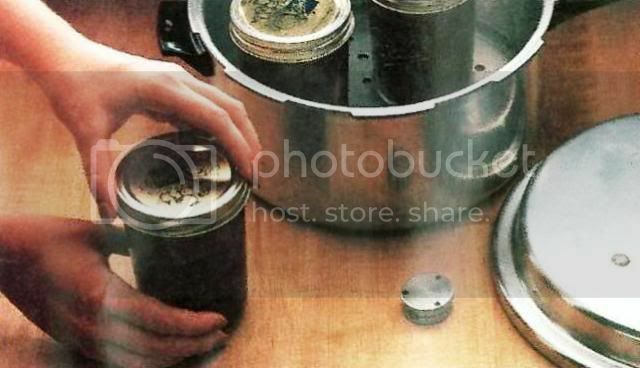 Place warm lids and bands on jars. Tighten firmly, but lightly. 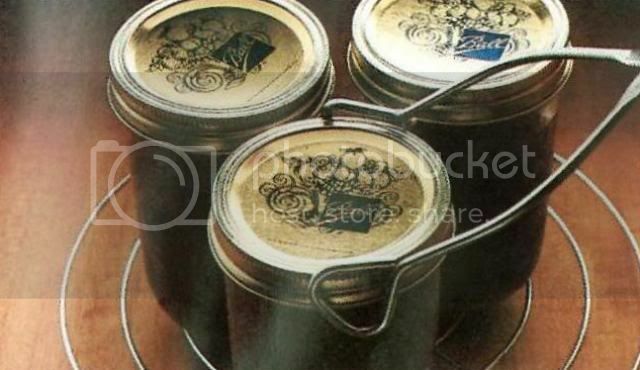 Place sealed jars on trivet in pressure cooker. Follow pressure cooker manufacturer’s directions for number of jars and amount of water to add to cooker. Heat until 10 pounds of pressure is reached, then begin timing. Process for 1-1/4 hours (75 minutes) at 10 pounds pressure. Allow pressure to drop naturally. When pressure has dropped completely, remove jars with tongs. Place in a draft-free place for 12 hours. Check seals according to lid manufacturer’s directions. Refrigerate any jars that have not sealed properly; use within 3 days. Store sealed jars in a dark, cool place; use within one year. Beautiful instructions, Ron! Great post, and recipe as well....I have really started to enjoy canning these past couple of years and appreciate you sharing such a delicious recipe. Pulling out a jar of meaty goodness in the middle of winter will sure warm one's soul as well as belly! Not enough folks can anymore and it sure is a skill that needs to be kept alive. i agree with that, john ~ and for those without a ready access to wild game, there is no reason why this recipe shouldn't work with other meats such as beef, pork, lamb, even turkey, i suppose. john (or anyone who does a lot of canning), if you don't mind, can i get an opinion from you on the canning times/pressure in this recipe? someone on another forum called the information into question, stating that he was a little nervous about the 10 lbs of pressure. since i have no practical, real-world experience with this from which to provide a foundation for an opinion, advice would be appreciated. You are perfectly correct and FOOD SAFE in your instructions. 10 LBS pressure is perfectly safe for any canning, subject to altitude adjustments. Food safety with regards to home canning is a combination of time and temperature and pressure. I made it a point to research the BALL Corp. "Blue Book" for home canning. All meats, poultry and seafood are recommended to be processed (canned) at 10LBS pressure in the home, subject to altitude adjustments. 1/2 and 1 Pint jars should be processed anywhere from 45 minutes (shrimp) to 100 minutes (Salmon and Shad) with all other meats in between. 1 1/2 Pint and Quart jars should be processed anywhere from 60 to 90 minutes with certain items not recommended due to the mass and jar size. Check your guidelines for specifics. Only Chicken A La King and seafood was not recommended in these sized jars. Game is fine. Hope this clarifies things for you and as well as our members and guests. Let's see if we can make this happen! I did try this over the weekend and things seemed to go pretty well. I haven't tasted the results yet, but expect them to be great. This was surprisingly easy and is definitely worth a try, if anyone is looking to clean out their freezer and/or have some canned meat that will come in handy for soups, stews, sandwiches and other dishes! Alrighty, I started making this tonight, pretty much according to the instructions above. I am without a camera right now, so I'll try to be descriptive. I have the applewood variety, and like it a lot; but to be honest, the original hickory is always a great go-to choice, and is highly recommended. I am hoping that a teaspoon per pound isn't too much, but considering the amount of meat and the liquid that will be added, it shouldn't be. I use a similar ratio for my jerky and it turns out fine. As I said before, I made the marinade according to the recipe; the only departures were in using brown sugar rather that white sugar, and using four garlic cloves, since the ones I had were a little below-average in size. Come to think of it, I also used olive oil, rather than vegetable oil, because that's what I had at hand. I guess I didn't follow the recipe as thoroughly as I thought, but that's okay. I used a wand blender to ensure a thorough mix of the marinade ingredients, then I cut three 1-pound venison roasts into several steaks approximately 3/4-inch-thick and put them in a large Zip-Lock style bag. I then poured all of the marinade over the venison, using a rubber spatula to scrape the side of the container. After pressing out all excess air and sealing the bag, I massaged it gently in order to work the marinade throughout the venison and put it in the refrigerator for the night. I will turn and massage the bag periodically. Tomorrow, in the spirit of the recipe, I will gently heat the steaks on a rack in the oven at 225 degrees for two or three hours, as I would if using a smoker. I will baste the venison as described, and will also follow the optional suggestion of topping the steaks with thinly-sliced onion. Meanwhile, I'll prepare the canning broth. I don't have any venison or beef stock on hand, and was going to use chicken stock, which would be fine, as the venison will make some of its own juice, too. However, it just occurred to me that I have some home-made demi glace made from reduced Hungarian partridge stock, so I might reconstitute it into the required 1 cup and use that, instead. One the canning broth is prepared, I'll cut the steaks into chunks and pack the venison into three 1-pint jars and process it in my 6-quart pressure cooker at 15 pounds (the adjustment for my elevation) for 75 minutes. It would probably be more "proper" to use a pressure canner, rather than a pressure cooker, but I don't have one yet. Using the pressure cooker worked just fine for me, and the canned venison was very good, even after over a year had passed, so I have no qualms about using it for this until I get a pressure canner. If you want to try this and only have a pressure cooker, you can make your own decisions. One note from the last time I did this: I didn't know how much water to add to the pressure cooker, but the instructions said not to fill it past 2/3 full, so I filled it to just under 2/3 full, and this seemed to work fine. Barring any contrary advice from someone who actually knows what s/he is doing, I'll do the same tomorrow, as well. This morning, I pre-heated my oven to 225 degrees removed the venison from the marinade and arranged the steaks on two racks sitting over cookie sheets. I then sliced a small onion as thinly as I could and arranged the slices over the venison steaks. After that, it was into the oven. There is a little bit of marinade left, so I'll brush that on the venison after 1 hour. After that, I'll check the steaks every 30 minutes until they seem done. The instructions are a little vague regarding this; in a hot smoker" (smoke-cooker), they should cook for "2 to 3 hours." If not smoking and cooking them on the stove-top, they should be cooked "to rare." This leaves a lot of room for interpretation, so I'll take it a step at a time. Once the venison is "done," I'll prepare the canning broth as described above, then proceed with the canning process. Note: The 1 tablespoon of liquid smoke seems to have worked quite well for the 3 pounds of venison. Anyone using this option should be on fairly solid ground doing it this way. The real test will be in the final product, but so far, so good. The link isn't active for me. I checked the link, and it seems to be working the way it should. Perhaps it is a cookie or cache issue? I do not know, but if I find anything put, I'll let you know. The jars of venison are currently in the pressure cooker, which seems to be functioning within normal parametres. I kept the steaks in the 225-degree oven for a little over 2 hours; this seemed to bring them to a little over medium, so perhaps 1.5 hours would work better. I will experiment with this in the future. In any case, after shutting off the oven, I washed and sterilised my jars and prepared the canning broth while the venison cooled slightly. For the canning broth, I used brown sugar, apple cider vinegar and Hungarian partridge stock. While the canning broth heated up, I cut the venison into cubes. Note: At the beginning of preparation, it might work better to cut the roasts into 1-inch steaks, rather than 3/4-inch, in order to get chunks and cubes that are more uniform. Once the steaks were cut into chunks, I packed them evenly into the three 1-pint jars, getting the same amount into each jar. I also put the thinly-sliced pieces of onion into the jars, as well. By this time, the canning broth was coming to a boil, so I poured it evenly into each of the three jars, once again getting the same amount into each jar. There didn't seem to be enough canning broth to fill the jars, so depending on how this turns out, I might double the amount of canning broth next time. My thinking is that it's better to have too much than not enough, but we'll see how things go. Once that was done, I put the lids on the jars and got the pressure cooker going, which brings me to where I am now. The processing time is 75 minutes at 15 pounds (for my altitude). In food processor* combine game, deviled ham, onion, salt and pepper. Chop to desired consistency. Add stock gradually to chopped meat until moistened to spreadable consistency. *You may prepare Big Game Sandwich Filling with meat grinder instead of food processor. In large mixing bowl, combine game, deviled ham, onion, salt and pepper. Mix well. Grind to desired consistency. Add stock gradually to ground meat until moistened to spreadable consistency.